In the area of Guerrero that lies along the Pacific coast we find the Danza de los Pescadores (fisherman). Today I will show five Pescador masks from my collection. The first of these illustrates some common features of these masks. They are usually painted black, and their faces have what appear to be bloody wounds. There is usually a cigarette hanging from one corner of the mouth. I bought this mask from Jaled Muyaes and Estela Ogazón in 1998. My mask collector friend John Levin observes that most Pescador masks have painted rather than carved wounds. Pescador masks don’t commonly bear an image of a skull and crossbones. In this case that design was painted before some of the bloodstains, so it may be an original feature. Then again, there seem to be earlier layers of paint under the surface layer, betrayed by flashes of turquoise or green. Once again this week I will examine a pair of Tlacololero masks with unusual, but somewhat related designs; they blend nose and mustache elements in an unexpected manner. I call these noses “geometric,” for want of a better term. Probably the best label for the first of these masks would be “surreal.” In a search of the Internet I found only one photo of another mask like the first. That one was said to be from Tixtla, Guerrero. 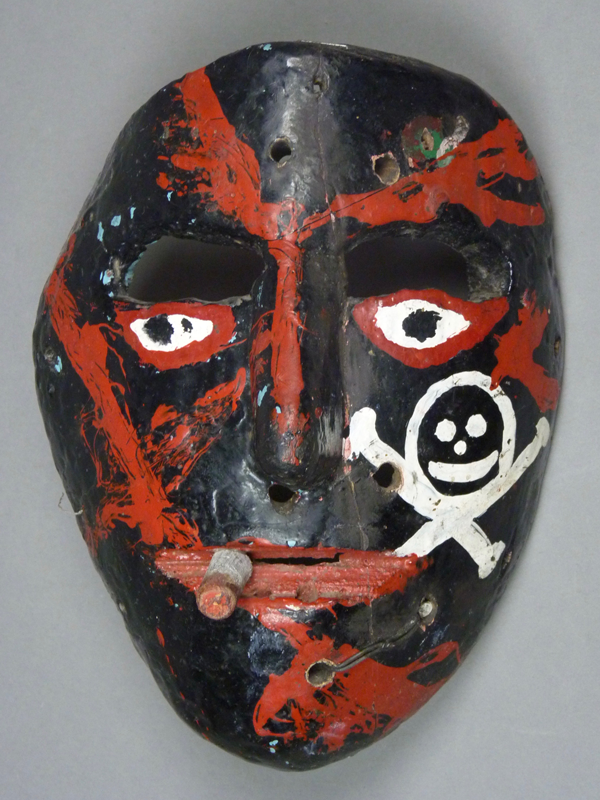 I purchased this first mask from René Bustamante in 1994. He reported that it was found in la Palmita, Guerrero, a place that is very small, and far away from the area where Tlacaloleros usually dance. I obtained the second mask in the same year from the Cavin-Morris gallery in New York City; it was said to be a Tlacololero from Zitlala, Guerrero. Here is the first. 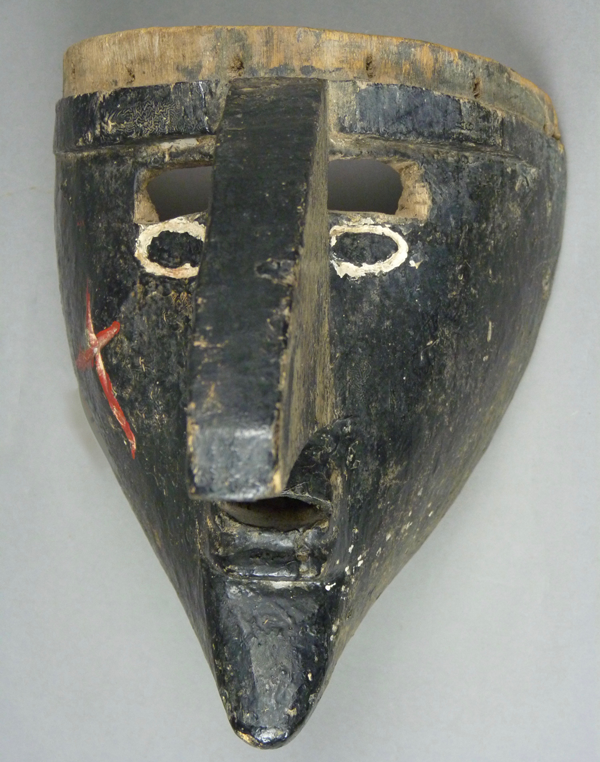 Obviously this is a rather primitive mask, with its relief carved nose that twists around to one side as if it becomes a one-sided mustache. The paint is also unusual, with multicolored spots. The carving of this mask is somewhat crude. However, the overall design is powerful and striking, and reminds me of images of god impersonators in the Codex documents, such as Codex Nutall. So, although this is a very unusual mask, it continues a theme from recent weeks, of god imagery. Today we will again begin with two masks of similar appearance. What these two have in common is a dramatically oversized nose, reminiscent of pre-Columbian images of Tlaloc or Ehecatl, the god of wind and rain, who was often depicted with a large bird’s beak in place of his mouth. Each also has a small blowing mouth. A third mask may be another example of this type, although a broken nose has made this less obvious. A fourth mask of similar layout in terms of the eyes and vision openings is distinguished by oversized ears and a remarkable mouth, not obviously blowing but wrinkled instead; it reminds me of the rueful expression often depicted on a well-known cartoon figure, Charlie Brown™. As I noted in an earlier post, scholars have suggested a connection between the Tlacololeros performance and other regional jaguar hunting dances with long standing regional indigenous beliefs and ceremonial practices about the weather. Briefly, these dances seem to reflect a tradition of petitioning for rain. If you are fluent in Spanish, then you may read more about this in a recent book by Rosalba Diaz Vázquez—El ritual de la lluvia en la tierra se los hombres-tigre [The Rain Petitioning Ceremony in the Region of Jaguar-Men], published by Conaculta in 2003. I obtained the first of these from Robin and Barbara Cleaver in 1987. The rim at the top is recessed to support a sheepskin wig, but this was long gone when I bought the mask. 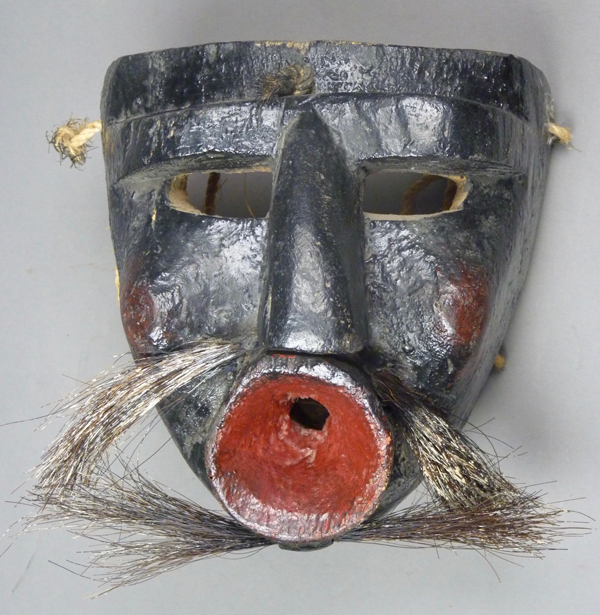 Today we will look at an unusual pair of Tlacololero masks that have blowing mouths—mouths shaped like funnels. Then we will examine another wonderful mask that is only somewhat similar. Next week we will see other Tlacololero masks that have smaller blowing mouths, but along with prominent noses that remind one of the those oversized bird’s beaks on Mesoamerican carved images of Tlaloc, the god of wind and rain. It is possible that all of these “wind” masks are related to weather shamanism. Here is the first one with a blowing mouth. 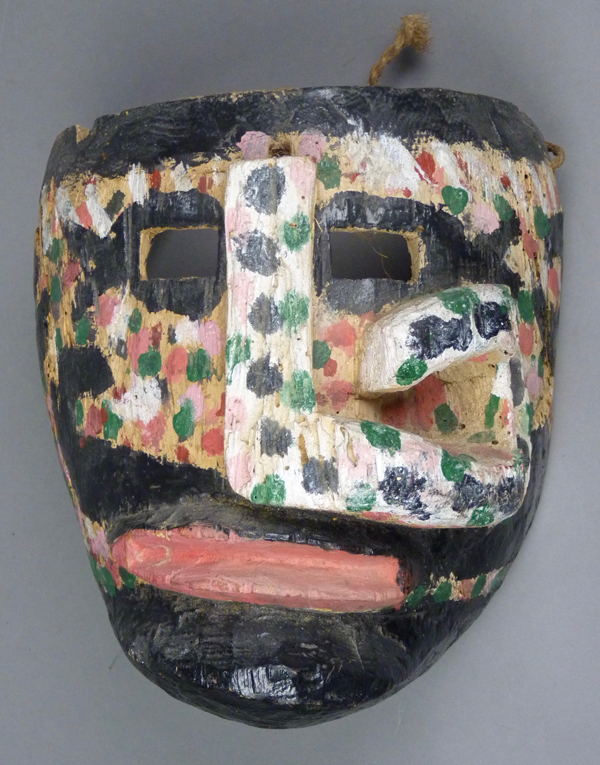 I bought this mask from Robin and Barbara Cleaver in June of 1988, when they held a remarkable show and sale in their Santa Fe gallery—Folklorico. It came with a limited provenance, a Tlacololero from the Mexican state of Guerrero. 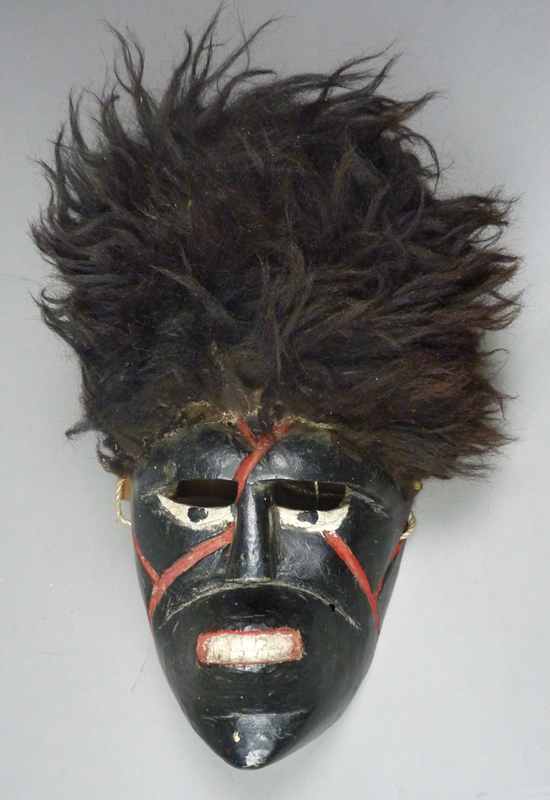 There is no mistaking the blowing expression of this mask.